PE lessons this half term will be on Wednesdays and Fridays. Please make sure your child has the correct kit in line with school policy. Homework will be set on a Friday – this should take no longer than 20 minutes maximum. Children need to return their homework books to school by the following Thursday at the latest, please. Spelling tests will be completed on a Thursday. We will record the scores and the books will be returned with spelling lists for the following week. Reading records are collected on a Monday morning so that the bookmark stickers can be updated. A big thank you to our Ethos Group who organised and led some fun Easter activities with an egg and spoon race and an egg hunt. We’re still hunting for the final 2 eggs – where can they be? In DT we have been busy exploring ways of joining materials in different ways to develop our construction skills. We looked at a range of bags and their design features before creating our own designs and constructing these from used materials. Finally we used paint to give them a quality finish. As part of British Science Week we enjoyed a workshop from United Utilities explaining where our water comes from and how we must use it wisely. We had lots of fun and lots of learning! We have been looking at thermometers and learning how to use the scale to measure the temperature. We have compared the temperature of cold water, warm water and a mixture of both. Now we are ready to apply this skill by using the thermometers in a scientific investigation. We’ll keep you posted! We enjoyed a visit to our local library, where we spent some time browsing the shelves and sharing books with friends. We each had our own favourites – picture books, information books, longer chapter books, even recipe books. Several of us are returning so we can borrow books to take home and enjoy at our leisure. Happy reading! The title of our latest RE Unit is “Jesus: Friend to Everyone.” We shared the story of how Jesus met and healed ten lepers. We thought about what their life must have been like before they met and Jesus, and how this changed once they had been healed. We used drama to explore this, working together in groups to create ‘before’ and ‘after’ tableaux . It is traditional for the people of the Ndeble tribe in South Africa to decorate the walls of their homes in bright geometric patterns. We learnt a little about this custom and looked at some images of their paintings. We used these ideas as inspiration for our own designs on our African Art Day using similar shapes, colours and patterns. Here are just some of our finished pieces. We got the New Year off to a good start by making personal organizers/calendars. This formed part of our English learning of spellings and use of capital letters. Once we had made the calendars, we wrote some detailed instructions on how to do this, before taking the planners home to use. What a fantastic performance we gave! Our Year Two Christmas play production this year was called ‘Born in a Barn’ and it told the story of how the animals reacted when they found out that a king had been born in their barn. The Christmas story of Jesus’ unfolded in music, dance and dialogue, reminding us of the real meaning of Christmas. We had worked hard in rehearsals and parents provided great costumes to make the final performances a real winner. Family and friends left with wide smiles and warm hearts. Merry Christmas! We showed our support of the ‘Choose Respect’ Anti-Bullying Week by wearing odd socks. Everybody’s choice was different but that’s because we are all different and special in our own unique way. We have started our project about Liverpool by exploring the cathedral and visiting the waterfront to see some of the historic and famous buildings of our closest city. We received a very warm welcome from our tour guide,Pauline, who showed us around the cathedral, sharing interesting facts and helping us to think about why this is such a special place. After lunch the coach took us down to the banks of the River Mersey where we enjoyed a brisk walk and a little sketching time before being wowed by the fantastic view from the modern Museum of Liverpool building. We did catch sight of the wonderful dazzle ferry, but time didn’t allow us to make that famous journey across the river. This week our Worship Team led our class worship, planning the activities and leading worship time themselves. They started with a fun guessing game – could we guess who it was just by feeling them with a blind fold on? We all watched and listened carefully as they read and acted out the story of how Jacob tricked Isaac into believing he was Esau. We reflected on times when we have not been fair to one another. A big thank you and well done to this half term’s team for doing such a super job! Have you ever wondered what it was like before washing machines? We investigated artefacts from Warrington Museum before using role play to recreate a washday from the past. It was hard work; and just when we thought we had finished we had to give the floor a good scrub too! Eating well is important to keeping ourselves healthy. Cathy from Asda brought us lots of lovely fruits to look at, taste and choose from to make a delicious yogurty snack. We tried pineapple, mango, raspberries, blueberries and mandarin. We all had our favourites, but mango was the most popular. Cathy showed us how to make our snacks by layering fruit and yogurt before adding a little squirt of honey. Mmmm, delicious! What is the Best Way to Clean Your Hands? We discussed what we could do to investigate different ways of cleaning our hands. We used oil and cinnamon to make our hands feel and look dirty. 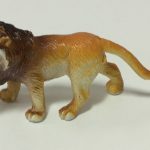 We then cleaned them in one of four ways – soap and water, hand gel, a wet wipe or just water. We made a note of our observations and used these to draw our conclusions. Soap and water was the only way of removing all the brown specks of cinnamon and the oil. The hand gel made very little difference at all. Why is the Bible Special? We have been learning about the Bible and why this book is special. We enjoyed looking at lots of different types of Bibles. We noticed that not all Bibles are the same, although the stories within them there. We chose our favourite version of the Bible and explained our reasons. Wow, what a year we have had in Year 1! We have overcome challenges, we have worked exceptionally hard, we have become much more independent and we have done it all with HUGE smiles on our faces. It has been an absolute pleasure teaching such a fantastic group of caring, determined, enthusiastic, polite and hard-working children. I will miss them all very much and I wish them the very best of luck as they move into Year 2. They are more than ready for it! I know that they will impress their new teacher as much as they have impressed me. Keep smiling, Year 2! how I LOVED to be your teacher, how fast the year did go! Please keep working hard in school, as through the years you GROW. Try hard to LEARN all that you can, there is so much to know. is to know that you are special just because you are YOU! We really enjoyed our visit to the library. We chose books to share with our friends, and then Miss Ashton read us a story. We were then told about a reading challenge that the library are holding during the school holidays called “Mischief Makers”. We were excited that we would get a medal when we had read six books! On Thursday we had our class assembly based on our ‘Let’s Play’ project. Some of us were a little bit nervous, but we really enjoyed sharing all our learning. We all wore superhero masks to begin the assembly with ‘Jesus You’re My Superhero’. We did some fantastic singing, and all the adults had big beaming smiles, which made us smile too. We all joined in reciting an exciting poem about going on a bear hunt, along with some percussion sound effects. Then we shared our toy pictures. When some of us pretended to move and dance like a musical box doll, and a robot, everyone was impressed. Some of us acted out part of a story about Kipper’s Birthday, and others dressed up as Toy Story characters whilst we sang ‘You’ve Got a Friend In Me’. We hope you all enjoyed our assembly as much as we did. We all felt really proud of ourselves, and we know our families and teachers were proud too. Miss Ashton’s Magically Marvellous Teddy Bear Museum! What a fantastic time we had creating our very own Teddy Bear Museum! 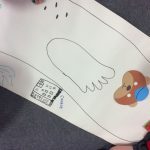 The children created their own tags for their teddy bears. They included fascinating facts including their bears’ special powers and features (Josie’s teddy even smelled like mint!). We enjoyed sharing our work with Miss Parson’s class. We have been thinking about developing our speaking and listening skills so we created a list of things to remember. Daniel said it was important to always smile at new people and Isabella said we should speak clearly and try to look at the person we are talking to. Afterwards, we enjoyed having a chit chat and sharing a biscuit (as did the cheeky teddies!). We’re so happy that we were able to share our work and make some new friends too. A big thank you to all the children for creating such brilliant teddy tags! Wow! What a fun afternoon we had at Scooter Training! We learned lots of top safety tips to help us to keep safe on the paths and when we cross the road. Then we had chance to scoot around at our own pace. We all had a great time, including the adults! What a gloriously sunny day it was for our Sports Day. Everybody tried their very best and that’s what counts! Well done to the winners, Red Team. They scored 62 points! We also enjoyed watching the parent and toddler races. Everybody had such a great time and we all went home with big smiles on our faces! We were so excited for our trip. We enjoyed our woodland walk around Walton Gardens. We explored the sensory garden. We even thought we spotted Mr McGregor’s house! Afterwards, we enjoyed counting the terrapins at the pond and the new baby goats at the zoo. We ate our lunch and had a surprise visit from Mrs Wightman! We loved dancing along to the samba music on the field! At Grappenhall Heys, we saw Peter Rabbit’s house! Kate told us all about the different edible plants that grow there. We even got the chance to plant our own sweet pea plants! We loved our tennis session. What a great way to spend a morning in the sunshine! We learned how to control the ball using our hands and rackets. Look at the concentration on our faces! We showed resilience and determination. Our tennis coach was so impressed (he said that we were one of the best classes that he had worked with!). We have enjoyed learning about space inventions and the work that astronauts do in space. We have looked at great female scientists including Helen Sharman and Marie Curie. We have also loved learning about Tim Peake. We were set a challenge by Helen and Tim to find out how long the craters of the moon are and how tall the aliens are. We had to use our knowledge of measuring from maths to help us. To measure the length of the craters, we had to use non-standard units of measure (units that can change, such as footprints and strides). We know that some people have larger footprints than others so this will affect the results! To measure the height of the aliens, we had to first find the starting point, in order to make our measurements accurate and fair. We then used standard units of measure (units which are always the same) such as cubes and paperclips. Miss Ashton set us a challenge by telling us the heights of various aliens and then asking us to draw aliens that were taller, shorter or the same size as them. We had a great time working as a team and testing our predictions! We couldn’t decide whether standard or non-standard units of measure are better to use, as it can depend on what you want to measure! Tim and Helen were very impressed with our hard work and team work. Wow! What a great week we have had celebrating Easter. We hope you all enjoyed our Easter service, we worked really hard to learn the songs and create our art work and prayers. We had a great Easter egg hunt and decorated our own Easter egg baskets. Well done to Dylan and Isla who won the prizes for their baskets! 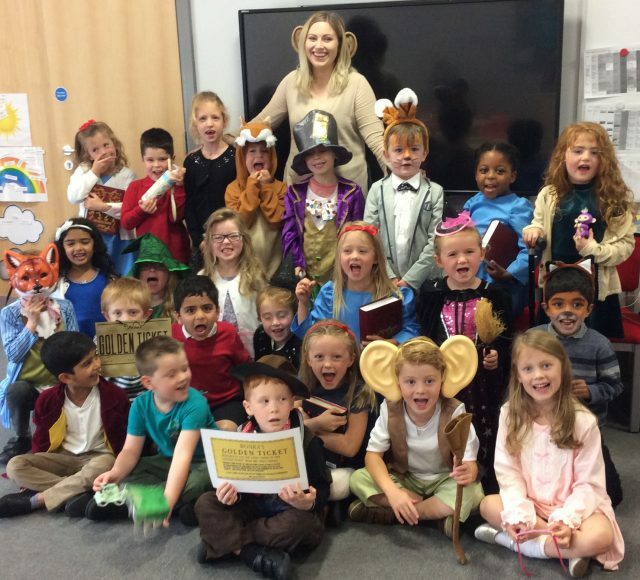 We had a fantastic time celebrating World Book Day! We loved dressing up in our costumes. We had a great time meeting the author Caryl Hart. She inspired us to keep writing and reading! Maybe one day we can be an author just like her. We loved having fun in the snow! What great teamwork we used to build our snowmen. We had a great time celebrating Chinese New Year! We retold the legend of Nian using drama. We made our own Chinese dragons, listened to Chinese music and watched a real dragon dance. Kung hei fat choy! During Health Week, we thought about the first Heartsmart rule which is ‘Don’t Forget to Let Love In’. We used the book ‘Words and Your Heart’ to think about how powerful our words can be. We also thought about how to keep our minds healthy and took part in some meditation. At first, it was hard to keep still but we enjoyed the challenge. We also thought about healthy eating. 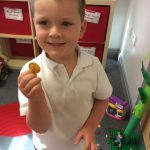 We designed, created and tasted our own animals which were made from fruit and vegetables. We were really excited to meet gymnast Jenny Dawes. She gave us lots of information about how to keep our bodies healthy. We have lots of budding gymnasts in Year 1 and they loved watching Jenny’s videos. Jenny also enjoyed hearing about their achievements in gymnastics and sports. This half term, we have been learning about animal body parts. We began by thinking about the human body parts we already knew and compared these with our favourite animals. We then discussed the similarities and differences between animals. We grouped the animals and thought about their characteristics. 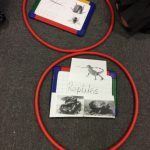 We looked at mammals, reptiles, birds, minibeasts, amphibians and fish. Can you think of a similarity between reptiles and birds? This half term, we are looking at photo and animation. 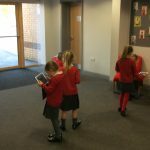 We went on a class room safari and practised using the iPad to take clear photos of the animals. During the half term, we will create posters for our safari and learn to animate our pictures! We have really enjoyed celebrating Christmas. We had a great time at our Christmas party! 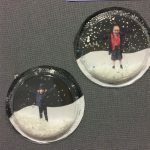 We have also completed some Christmas crafts. 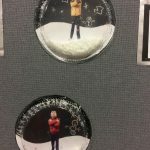 We have completed lots of experiments to find out how ice melts. We began by helping Sunny free his penguin friends from the ice bergs. We had to choose the best material to melt the ice first. We then experimented with using salt to melt ice. We were shocked to find out that the texture of the ice changed from smooth to bumpy. The salt made beautiful ice crystals! Finally, we helped Olaf and Kristoff to melt Anna’s frozen heart. We found that hot water was best. We know that water can be made into ice when it is frozen in a cold place. Heat melts ice and turns it back into water. This half term, we have been looking at programming in our Computing lessons. Linking to our project, we needed to help the Beebots travel around the world to visit their friend Sunny the meerkat. We began by familiarising ourselves with the Beebot buttons and functions. We were challenged to make the Beebot move backwards, forwards, left and right and make full and half turns. We then had to learn how to help the Beebots travel to different countries around the world. We worked with a partner to generate a set of instructions, or an ‘algorithm’, to help us travel from A to B. 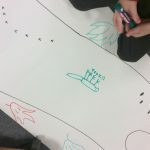 We created our own maps and roads to help us. 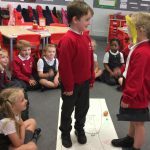 We then recorded our algorithms using the symbols on the Beebot to help us. We combined our maps to create more complicated algorithms. This was much more challenging! Finally, we swapped maps and had to de-bug one another’s algorithms to help the Beebots travel to each place correctly. This year, our Christmas play is called ‘Prickly Hay’. It is all about the stable that baby Jesus was born in and it has a Wild West theme! It also reminds us that we are all important, regardless of how big or small we think that our job is. The children absolutely loved learning all of the songs, dances and words for the play and they looked fantastic in their costumes! Some of our fantastic stable animals. The brilliant Innkeeper and Star. Our Wild West Stars. Yee haw! We arrived at school on Monday to find something very exciting. There was a brand new icy igloo in the classroom! We got straight to work writing our predictions about who, or what, could have put it there. We then discovered a penguin inside the igloo and a message from our friend Sunny. 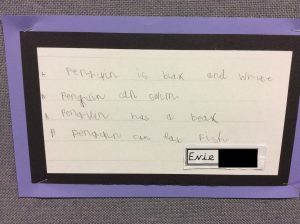 He asked us to gather as much information as possible about the penguin to help us create a fact file. We had already begun looking at non-fiction texts during reading times so we were definitely up to the challenge. 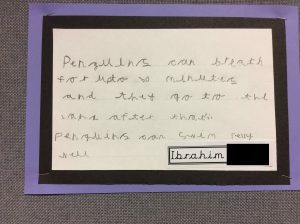 Ibrahim was surprised to find out that penguins can hold their breath for up to thirty minutes underwater! Sarah discovered that they are expert swimmers and that their special waterproof feathers help them to glide through the water. Max found out that the daddy emperor penguins have to look after the eggs, whilst the mummies go to hunt for food! Harry told us that not all penguins live in cold places and some prefer to live in warmer places like the Galapagos Islands. 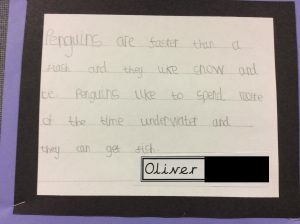 As you can imagine, our penguin fact files were packed with information! 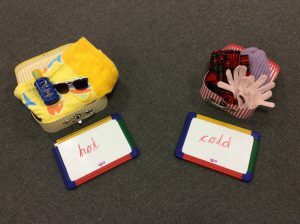 Later in the week, we continued our work about hot and cold countries during Geography. The children told me that they really wanted to learn more about sporting events in hot and cold countries… in particular, MotoGP! Dylan told us that MotoGP has 18 races that take place in 15 different countries around the world. Some of them are hot and some of them are cold. We had to help Sunny pack a suitcase for each trip, thinking carefully about what he would need to take and why. 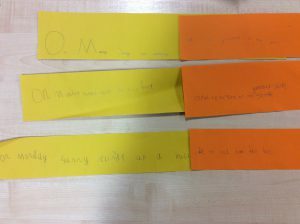 We used the conjunction ‘because’ to join our sentences. We rounded off the week with lots of exciting activities linked to cold countries. 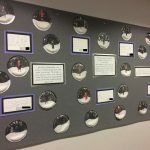 We completed an amazing experiment making magic snow and used penguins to help us practise our high frequency words and number bonds. 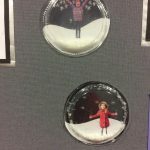 Our favourite activity was making our snow globes. It was so much fun! We were very excited to begin the new half term with a brand new parcel from Sunny. We explored the clues and used what we knew to help us make predictions about where he had been this time. Daniel said he thought that Sunny had been to China because he noticed some beautiful writing on the lantern. Isla thought the colourful fan had come from somewhere in Asia! Sunny’s letter also told us that he had been eating sushi in Tokyo and was finding it very tricky to use chopsticks to eat! Where do you think he could have been? We discovered that Sunny had been to Japan! We then began reading the ‘Meerkat Mail’ story. In the story, Sunny visits a different place every day. This inspired us with our writing. We know that days of the week need capital letters, so we used our magic punctuation glasses to help us remember where to include them! We also tried to extend our sentences by using the conjunction ‘and’ to join two sensible ideas. Our next project is called ‘You’ve Got Mail’ and will focus on hot and cold countries around the world. We were thrilled to receive a special parcel this week. The parcel was from Sunny the Meerkat who is travelling the world to find a new home. There were lots of clues inside the parcel and we had to work out where we thought Sunny could be. 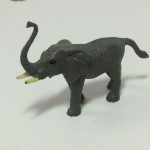 The clues included rice, a tealight, a beautiful necklace, an elephant and some unusual money called rupees. We used what we knew about our Diwali celebrations to help us and we decided that it must have come from India. 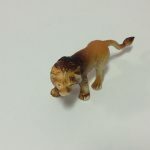 We are so excited to receive more parcels from Sunny. We had an exciting time celebrating Diwali! We learned that Diwali is known as the ‘Festival of Lights’. We had a whole school Diwali celebration and learned lots about it. We enjoyed learning about the different Diwali traditions. One of our favourite activities was looking at the amazing rangoli patterns. We created some of our own using oil pastels and thought carefully about the mirrored shapes and curves. We were very fortunate to be able to decorate a beautiful rangoli template using sand paints which were very kindly donated by Mrs Odak. We thoroughly enjoyed reading the story of Rama and Sita. 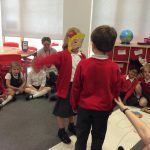 We used roleplay to retell the story. Can you tell which characters we are? We also took part in a traditional Indian dance workshop. We learned some mudras, which are hand gestures that look like different animals. These included the lion head, the crab and the crocodile. For our seasons work, we looked at the artist Andy Goldsworthy. Andy uses natural materials such as leaves, twigs and stones to create amazing pieces of art. We were inspired by Goldsworthy and tried to gather as many natural materials as possible from the playgrounds. I am always so impressed with the children’s team work. They are very patient and considerate of one another’s ideas. Isabella gathered lots of leaves to create a picture of a nest. Dylan enjoyed working as part of a team to create a very unusual piece of art! We have been focusing on the key words ‘team work’, ‘collaboration’ and ‘communication’. We played a team game which needed us to apply our mapping skills learned in Geography. We had to use the map to navigate the playground and find coloured cones for our team. However, we had to make sure that we held onto our team hoop at all times! If anybody tried to race ahead and let go of the hoop, the whole team faced a ten second penalty. We had to use our listening skills to communicate with our team, so they knew where we needed to go. We used encouragement to ensure the team worked well together. We then had to take our cones to the quiet area of the playground and use this half term’s phonics learning to unscramble words. We could identify the ‘ur’, ‘er’, ‘aw’ and ‘au’ sounds. This half term, our ‘Sports Star’ is Swasti, because she listens to her team and communicates well to achieve the objective. 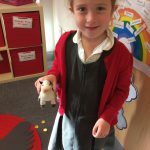 We have learned all about Harvest. We began by talking about the Harvest process. We know that many crops are planted in spring, grow during summer and are then harvested in autumn (before it gets too cold!). We wanted to find out more about how our favourite fruit and vegetables are harvested. We are so used to being able to go to a supermarket and pick any food that we like that we don’t always think about where it has come from. We were amazed to find out that some of favourite foods are grown all over the world! We used our atlases to find the different places. We were shocked to find out that cocoa beans can be grown in South America and rice can be grown in Asia! We then food tested different foods that are grown all over the world. The children enjoyed food including pineapple, watermelon, plum, pomegranate and aubergine. They were very brave and gave everything a go. During the week, we have also been learning songs and creating art work and prayers for our Harvest assembly. Miss Ashton was SO proud of our beautiful sitting, singing, speaking and listening during the assembly. We hope that all of the adults enjoyed it. A big “thank you” for all of the generous donations for the food bank. We used what we knew about traditional tales to help us with our drama work based on the ‘Into The Forest’ story. The story is about a boy who gets lost in the forest and bumps into lots of different fairy tale characters. Before reading the book, we looked at the front cover and found lots of hidden clues. We used these to help us create a story map of drawings, labels and ideas. 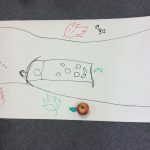 We thought about what we would see, hear, taste, smell and feel if we were walking through the forest. 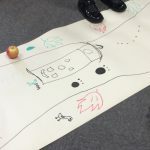 We then had to walk down the path carefully, using role-play to imagine what it would be like. We were so excited for our Lego Workshop! 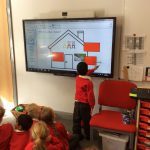 Stephen showed us the best ways to build a strong house. We made bungalows, hotels, shops, schools… They had a roof, balconies, gardens and lifts. Each one looked completely different. We tried to overlap the bricks to make our buildings stronger. When we had finished constructing our own houses, we joined them all together to make a huge Lego city! Stephen showed us how to make the bulb inside our house light up using a battery, wires and a switch. This was very tricky! However, our Lego city looked fantastic and all of our buildings looked very warm and cosy. We had a very strange start to the week! 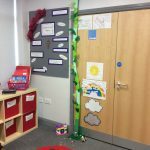 We found a giant beanstalk growing in our classroom. 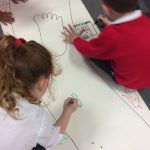 Linking to our alternative traditional tales project, we loved the story of ‘Jack and the Jelly Beanstalk’. We discussed which materials we thought would create the strongest beanstalks. Sarah thought rock would be strongest because it is solid. Max thought that metal would be best because it can’t blow down in the wind. Annabelle preferred wood, but Aarin pointed out that it would get soggy if it rained! 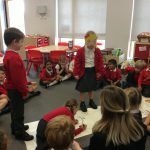 For our Science learning, we had to find the strongest material to build a new beanstalk for Jack, however….inspired by the story, Miss Ashton challenged us to use sweets to build it! We thought about the different reasons why the beanstalk needed to be strong: it needed to be able to hold Jack’s weight and it needed to stay upright during different types of weather. We enjoyed investigating just how strong our beanstalks really were. We found chocolate to be the strongest material, although Lucas hoped that it wouldn’t melt in the sun! Well, what an exciting day! We began with a whole school assembly led by the Altru drama group. It was so much fun! They helped us to put the Dahl books into a timeline. We loved dressing up and had a special character parade. The best part of all was using the Green Screen app on the iPads. Miss Ashton put us inside our favourite books! We had a good giggle and talked about why we liked the characters so much. Watch the video below! 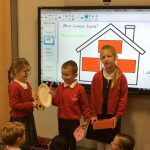 On Monday morning, we were shocked to find a brand new house in our class room! We wondered who could live there. We searched inside and found lots of clues! We collected the clues and made predictions using the pronoun I. We used what we know to help us. We wrote about our predictions and found out later that… it belongs to the three little wolves! Our predictions were not correct but we were proud that we all had a go. We read the story ‘The Three Little Wolves and the Big Bad Pig’ and painted and decorated the house for the wolves. We will continue to learn about alternative traditional tales throughout the half term. It has been lovely getting to know the children and welcoming them into Year 1. We have had a very exciting first week full of giggles and discoveries. 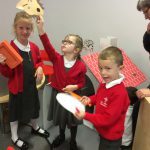 The children have enjoyed exploring their new classroom and taking on new learning challenges. 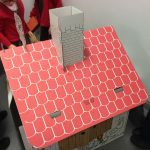 To introduce our new project, ‘Down My Street’, we looked at lots of familiar homes and lots of unusual homes! We LOVED junk modelling. 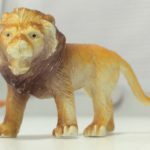 Take a look at some of our fantastic creations. Evie, Sarah and Ilyas made lighthouses with lights on top, so all of the boats could see them in the dark. Swasti made a detached house. Oliver made a bungalow. Isla and Aarin made a house with a chimney. They even made smoke clouds! Delilah, Isabella and Max made a disco house with a light up floor! We’d all like to visit their house. 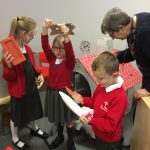 It was fantastic to see the children working together and sharing resources and ideas. We also enjoyed PE. This half term, we will be learning outdoor, adventurous activities (OAA). We discussed the tricky word ‘co-operation’. We worked in teams and had to think of the best ways to pass the hoop around the circle whilst holding hands. This was a challenge but the children loved working together! Eva and Dylan were our PE stars of the week for being such fantastic team leaders.